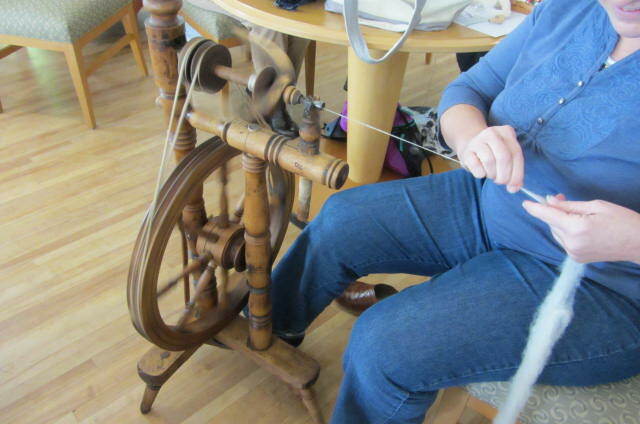 It all started years ago, when I had angora rabbits, and got interested in spinning their fur. 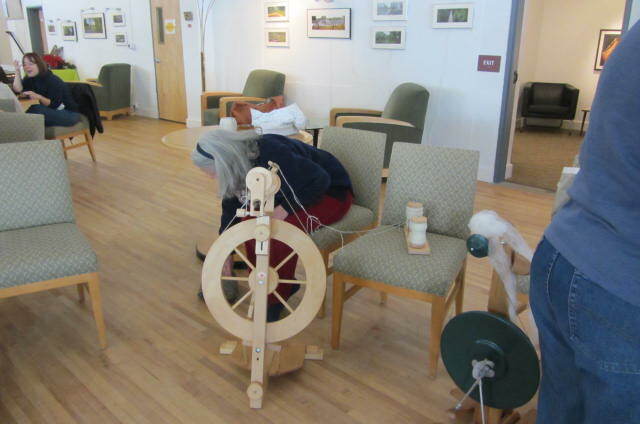 I took some lessons, had a big Ashford wheel, and as things go when you have small children, spinning fell by the wayside. 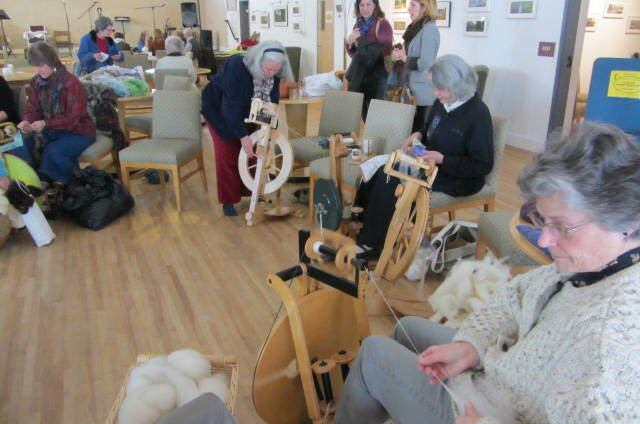 Fast forward 20 some odd years, and my interest was again piqued, when I had an old spinning wheel refurbished. For years, my mom had been carrying around an old wheel she unearthed over 30 years ago in an antique shop. Thru’ all her travels with my dad in their RV, this wheel came along, but was definitely worse for wear, and literally in pieces. 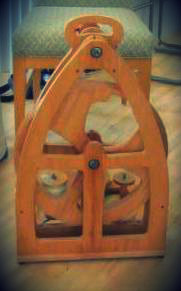 I was put in contact with a wonderful woodworker named John Robson, who brought this old wheel back to life!! It is a treasure- circa late 1700’s-early 1800’s. 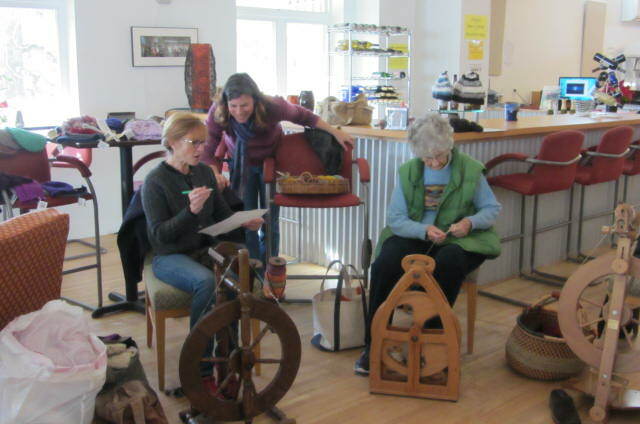 There was a celebration in town today – a group of local spinners got together at Plan B in Broadway, Va, to celebrate Rock Day. Rock Day (rock, roc, or rocke) , or, St. Distaff’s Day, is a celebration on the Monday after Twelfth Night- the Festival of the Epiphany. 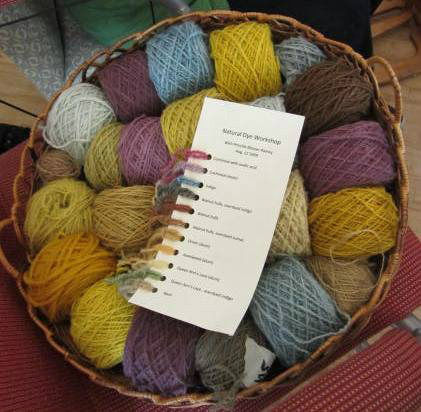 The term rock is no longer used – but in times past it referred to the distaff– the long piece of wood used to hold unspun fibers/wool while spinning. 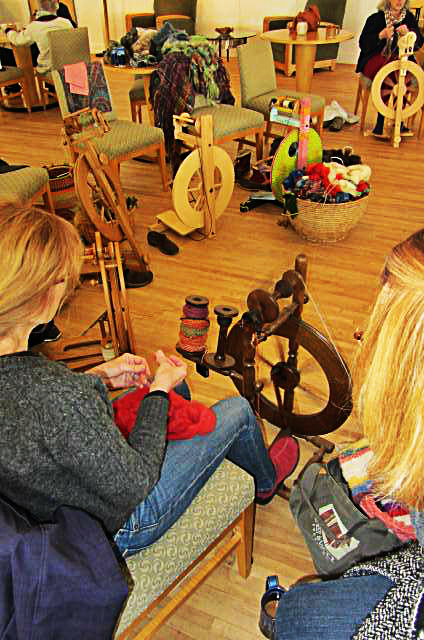 In olden days, the day after Twelfth Night, was when all the festivities of the holidays were over and done with, and it was back to the mundane chores of everyday living- which included spinning! 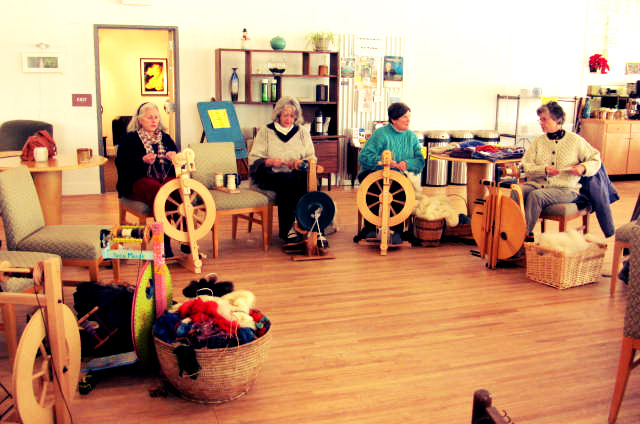 So, very similar to our present day quilting bees, it has become a tradition for spinners everywhere to come together in groups to celebrate the day, and just spin, chat, and share. 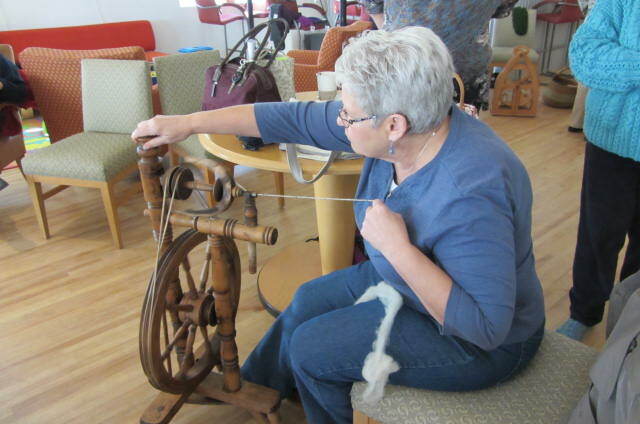 I brought my old wheel down for advise, and Sue Ober was kind enough to get it working – the general opinion was it is a very nice, very old wheel – in great shape, and totally usable!!! Woohoo!! Money well spent in bringing it back to life!! 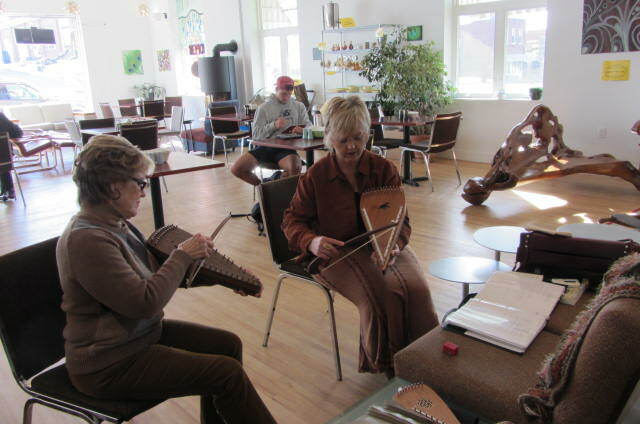 The atmosphere was welcoming, there was live music perfectly attuned to spinning. 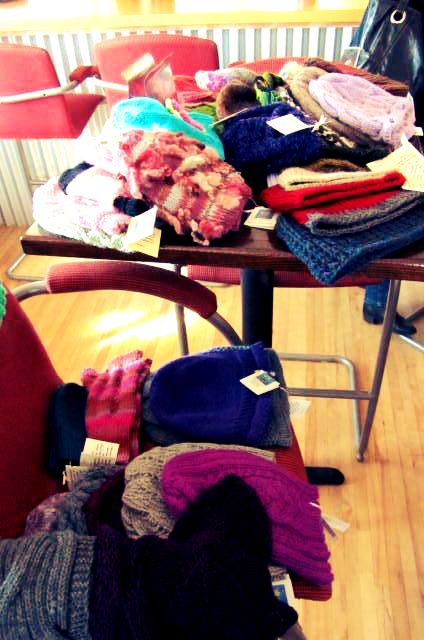 Beautiful handcrafted items were for sale – felted bags, mittens, fingerless gloves, hats, in wool and fiber of every hue. 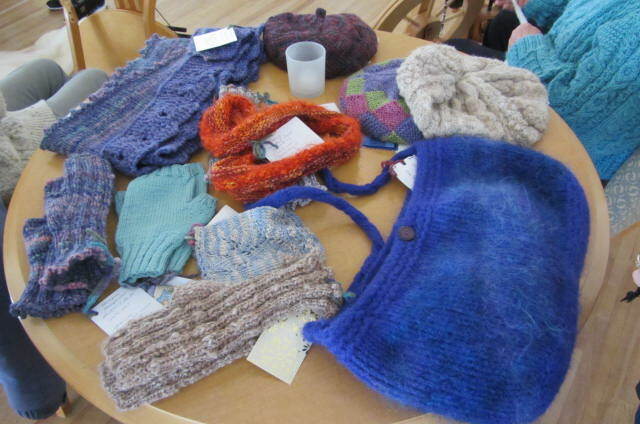 Most all the items were made from scratch – literally in some cases, straight from the spinner’s shorn sheep, goat, or alpaca- carded, cleaned, dyed,and then spun, and knitted or felted into beautiful creations! 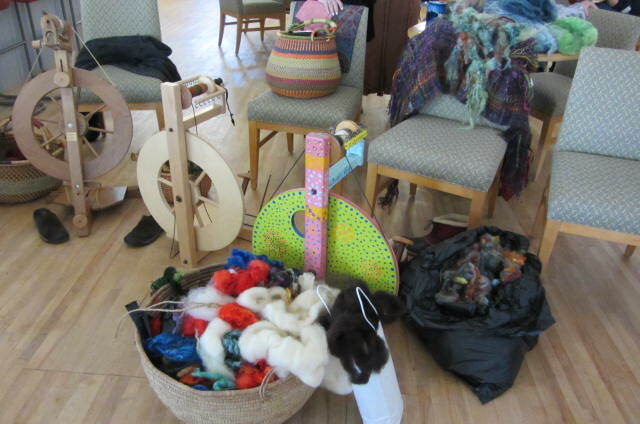 And, the wheels- oh, the wheels– so many different kinds- not at all the “traditional” looking wheel I remember. Their smaller size makes them very portable. And, there was one that was painted, giving it its own unique character! 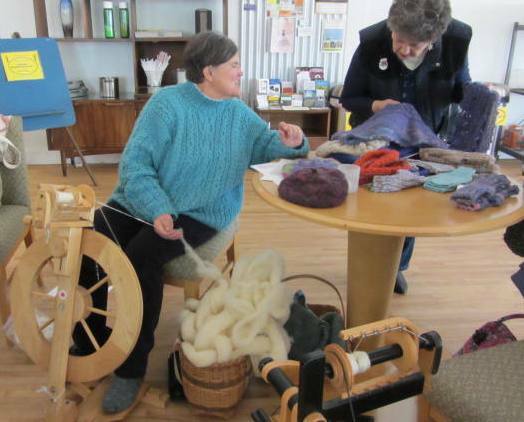 That is Priscilla Blosser Rainey (hope I spelled her name correctly) on the right in the green vest- she made the beautiful hand dyed yarn pictured above. 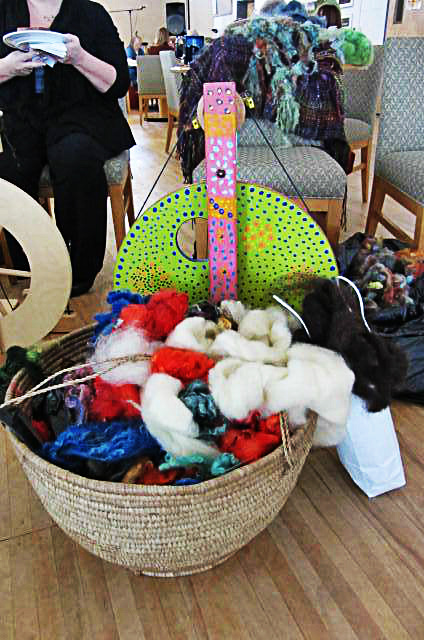 All in all, a great day- creativity, camaraderie, food, fiber– what more could you ask for?? ?